Enjoy a relazing moment with friends, even in cool weather. Handcrafted in rust-resistant cast aluminum with "All Weather" woven two-tone vinyl/resin swivel chairs that provide supremely comfortable seating without the need for cushions. 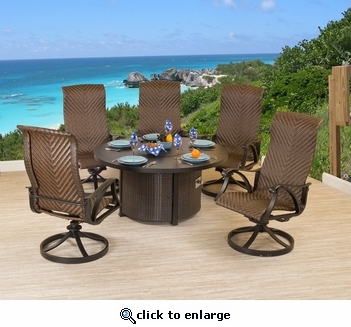 This rich bronze finished cast aluminum set is easy to care for. When the fire pan is not in use, the included decorative cover provides extra table space. Also features decorative fire glass and a hidden propane tank.